Nat Gould wrote well over a hundred published books, and many stories and non-fiction articles published in newspapers and magazines that were never re-published in book form. The earliest published stories were Australian newspaper serials. The count is further complicated by the reissue of some published novels under different titles or with amended texts. However, the total number of distinct published books appears to be 131. Of them, nine were written in Sydney and published by Routledge, 108 were written in England and published by Routledge from 1896 to 1900, by Everett from 1900 to 1905, and by John Long from 1905 to 1927. The remaining fourteen books were Annuals, the first of which was published by Everett in 1900, and the others by Everett in 1903 and 1904 and by John Long from 1905 until 1915. His earliest books also appeared as “Yellowbacks”, the popular nickname given to editions that first appeared on railway bookstalls in 1853. Usually they were light reading and cost two shillings. They have rarely survived in pristine condition. Everett and John Long both continued publishing Nat Gould's books as yellowbacks, at the author's insistence, even when this format was becoming obsolescent (1). Four of his books describe life in England or Australia, and are partly autobiographical. They are On and Off the Turf in Australia (1895), Town and Bush: Stray Notes on Australia (1896), Sporting Sketches being Recollections and Reflections on a Variety of Subjects connected with Sport Horses and Horsemen, never before published (1900), and The Magic of Sport: Mainly Autobiographical (1909). A full list of Nat Gould books and the annuals known to have been published has been compiled for this website from information in major library catalogues and book lists, booksellers' advertisements, and advertisements in copies of the books themselves. From 1920 some of the novels originally published by Everett were reprinted by G.H. 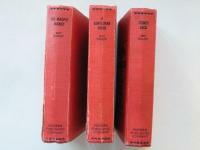 Robinson and J. Birch, and from about 1925 to 1935 many more as red hardbacks by The Modern Publishing Company. After the death of John Long in 1936, some of the books were published in similar format by The Leisure Library Co. Ltd until the outbreak of World War II in 1939. After the war ended many of the novels were issued as paperbacks, notably by the Mellifont Press and Hutchinsons. No further hardbacks editions appeared, however, until present-day publishers began producing them to order. From the first publication of his books Nat Gould has had some hostile critics but far more enthusiastic admirers. Seven novels were made into films: The Chance of a Lifetime (1916), A Gamble for Love (1917), A Turf Conspiracy (1918), A Fortune at Stake (1918), A Great Coup(1919), A Dead Certainty (1920) and A Rank Outsider (1920). Of these films had already been dramatised for the stage. The screen writers of the films of The Chance of a Lifetime and A Fortune at Stake are unknown. Benedict James was the writer for A Gamble for Love (1917), Bannister Merwin for A Turf Conspiracy (1918), J. Bertram Brown for A Great Coup (1919), and Patrick L. Mannock for A Dead Certainty and A Rank Outsider (both 1920) (2). (1) The Magic of Sport pages 203 and 204; Nat Gould: the Biography by Tom Askey (2017) pages 78, 105-106, 109, 114, 118 and 129. (2) Other films bearing titles of Nat Gould novels are The Second String (1915) and Warned Off (1920) but whether they are based on the novels of the same names is unknown. The director of Warned Off was Walter West 1885-1958 who had also directed or produced the films based on A Fortune at Stake, A Great Coup, A Gamble for Love and A Turf Conspiracy.